There is no other way to describe our trip to South Africa except life changing. Ever since I was little I have been enthralled by the wildlife of Africa and to finally come face to face with these magnificent animals in the wild was an experience of a lifetime. 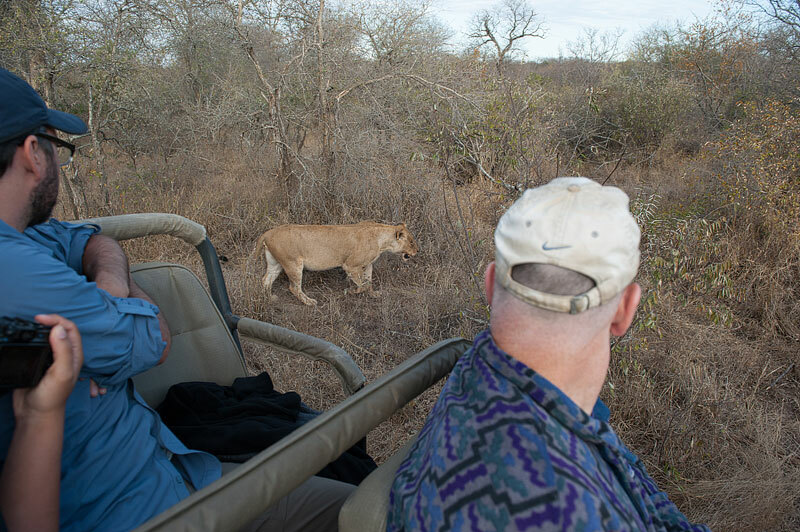 Imagine watching a lion walk right by your safari vehicle, a leopard so close you could touch it (although I would advise against it), or being 10 feet from an elephant staring right at you and your guide uttering “don’t move,” it’s hard to even put into words. 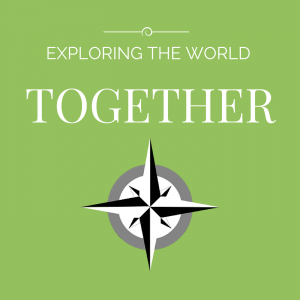 Planning for our safari was a huge undertaking and we learned a lot along the way. We made the decision towards the end of 2012 to go which was just enough time for us to get all our vaccinations which included Hepatitis A/B, Typhoid, Malaria, as well as make sure that our vaccinations for Polio, Tetanus, Chicken Pox, Measles and Mumps were still active. South Africa also requires a Yellow Fever vaccination if you are coming from certain countries. The CDC also advised that we get rabies vaccinations but at the time there was a shortage of the vaccination in the U.S. so we had apply for the vaccinations, which ended up being denied. The vaccination was really expensive anyway and it doesn’t even protect you from rabies, just gives you a little bit more time to get to the hospital. Besides learning about the health issues we also had to plan for the safari. Brendan had heard that Kruger National Park in South Africa was an amazing park for seeing a lot of wildlife. 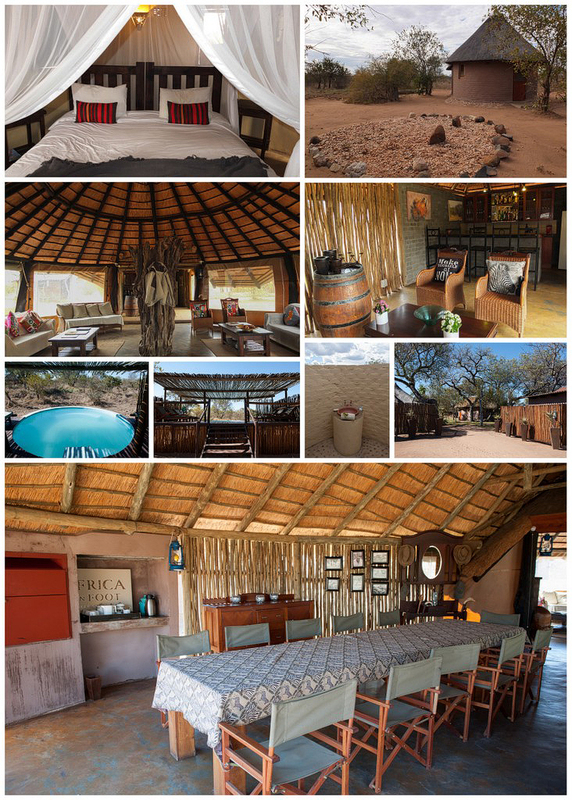 Once I started researching about safari camps, I learned that all the safari camps are actually located outside the park on private reserve land that borders Kruger National Park. There are no fences along the borders of the camps or the national park so wildlife is allowed to roam the land freely. The major difference between the private reserve land and the national park land is that in the national park you must stay on the roads, while in the reserves you can go off-road and track wildlife. The national park is mostly for self-driving through the park and there are campgrounds/lodges that you can stay at. Since this was our first visit to South Africa we decided we were not ready to self-drive. There are a vast array of safari camps available each with their own character and style as well as price point, from 5 star luxury resorts that can cost almost $1,000 a night to basic tented camps. We didn’t need a 5 star resort (nor could we afford one!) but we definitely wanted a camp that was comfortable and that would fit our budget. Lots of research later and with lots of help from SafariTalk.net (a forum about safaris and wildlife conservation) as well Sun Destinations we booked a 4 night/3 day stay at Africa on Foot in the Klaserie Private Game Reserve and a 3 night/2 day stay at Umkumbe in the Sabi Sands Private Game Reserve. Sun Destinations handled all of our reservations as well as our transportation to/from each camp. We flew Delta from Bangor to LaGuardia to Atlanta, with our final flight to Johannesburg lasting 16 hours. We left Saturday morning and arrived about 5pm on Sunday while the sun was setting over Johannesburg. We had completely forgotten that it would be winter in the Southern Hemisphere so the sun would be rising later and setting earlier. We took a 30 minute taxi ride to our hotel, the Hilton in Sandton. You would think that arriving at night and being able to go right to sleep would make it easy for your body to adjust to jet lag, but it still took us 2-3 days to get acclimated. We only had one day in Jo’Burg and of course the one place I wanted to visit, the Apartheid Museum, was closed on Monday. We were really too exhausted to do much exploring, and Jo’Burg is huge and spread out, so we decided to walk around Sandton and go to Nelson Mandela Square, which is really just a shopping mall with a statue of Nelson Mandela outside. Sandton is a very upscale and the business center of Jo’Burg and was not what I expected of Africa at all. The next morning was our flight to Hoedspruit Airport where we were greeted by Rein, one of the guides from Africa on Foot, and we headed to camp about 45 minutes away. On the drive we saw giraffes and baboons and I am in a daze, awestruck that we are actually here. When we arrive at camp the most important thing we learn is to always be aware of your surroundings while in camp because there are no fences, meaning that animals can wander through the camp at any time. Elephants have been known to drink from the swimming pool! Our chalet, which is rustic, but lovely and very comfortable only has screens on the windows and each night we heard the sounds of animals, several nights we heard lions roar which was very special! Our last night we woke early in the morning to find a herd of over a hundred Cape Buffalo outside our chalet. Brendan and I were safely viewing them over our outdoor shower wall. Of course with Brendan’s height he can just look over the wall, while I had to stand on the sink, lol! Matt came over to let us know that as soon as the buffalo left we could come over for breakfast but he had to leave because he was in “imminent danger.” Apparently the Cape Buffalo are the most dangerous of the Big 5, because they are so unpredictable and there are so many together. One of the things we loved so much about Africa on Foot is that each morning instead of going on a game drive they took us on a three hour walk in the bush. There are only a few camps that offer this and one of the reasons we booked our safari with them. As our guides so eloquently stated, by heading out on foot you are now part of the “food chain” and the experience is very different than being in a vehicle. The guides carry very large caliber rifles, everyone walks in single file and there is no talking; the guides use their sense of hearing more than sight to track wildlife. 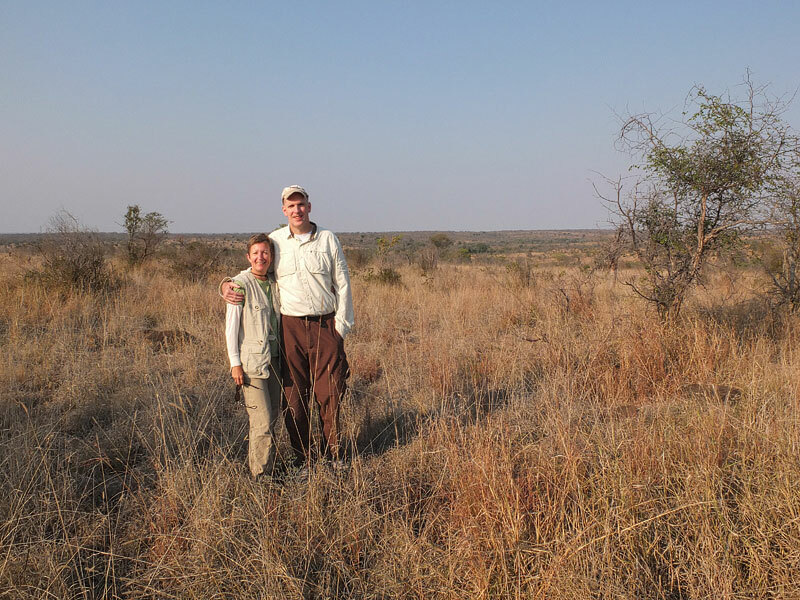 We learned a lot about the smaller wildlife and ecology of the bush while on these walks but we also saw giraffes as well as tracking the Cape Buffalo that had come into camp. After our walks we would return to camp, have a wonderful breakfast and then relax around camp for several hours before lunch and then going out on the afternoon game drive. When we first arrived at camp it was early afternoon so we would get to go out on our first game drive that day. There were only four other guests in camp (the camp only sleeps 10, so it is very intimate), so there was a lot of room in the jeep. Our guides Matt and Rein traded off duties each day from either driving or tracking animals (the tracker sits on a seat right at the very front of the vehicle). 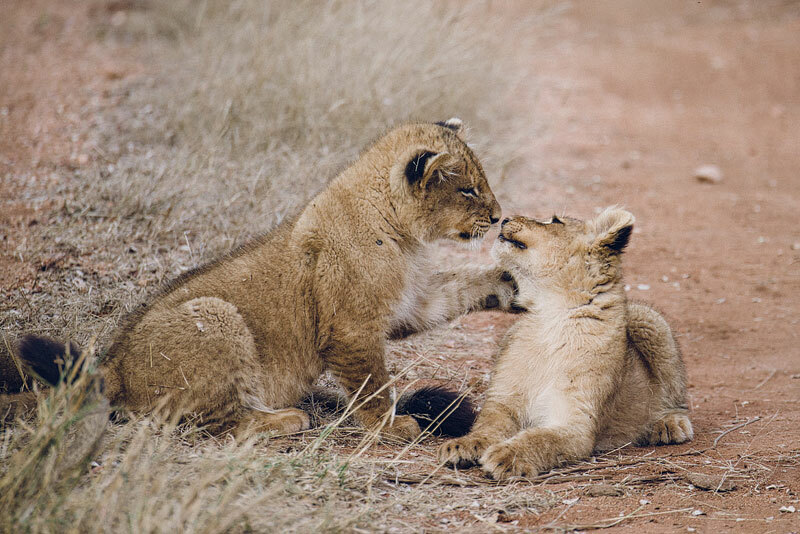 There is a pride of lions on the reserve and they have been feasting on an elephant that had to be put down by the reserve ranger because it had hurt its foot several weeks before and had been suffering and left behind by the herd. It’s unusual for them to do this, normally they would let nature take its course. We were so lucky to get a chance to see this and I was in absolute heaven! Game drives were very different than walking in the bush. The animals are not bothered by the vehicles because they have grown up with them and don’t see them as a threat. As long as you stay seated they almost completely ignore it and we were amazed at the close encounters we had with animals, including lions walking right by us. We saw an amazing amount of animals and managed to see four of the Big 5. The Big 5 are the five big game hunting animals, the cape buffalo, elephant, leopard, lion, and rhinoceros. One of our most memorable experiences was driving past an elephant who gave us a warning that he wasn’t happy by shaking his head, flapping his ears and trumpeting very loudly. Meals at Africa on Foot were spent around one large table with Matt and Rein joining us as well. It was a great way to recap the days events and get to know each other. One evening we returned from our game drive to find our dinner table set up out under the stars, which was a wonderful surprise. When it came time for us to leave Africa on Foot we were sad to go, it was such an incredible experience and we loved every minute of our stay there, but it was time to go on our next safari adventure in the Sabi Sands. Our driver picked us up and we had a very long 2.5 hour drive over extremely rough, dirt roads and when it was actually tar it was even scarier. I was afraid to even watch him drive. We traveled through two towns that were exactly how I pictured Africa and we even saw a cow being sacrificed in a ceremony! The night before we were treated to an amazing lightening show on our game drive before a storm rolled in and now the weather was dreary and overcast. This seemed to affect our wildlife sightings after we arrived at Umkumbe and we didn’t see much large wildlife until the following afternoon. Our first morning there we were given the option of going on a bush walk instead of a game drive by one of their guides. This was a treat since they normally don’t do long bush walks. 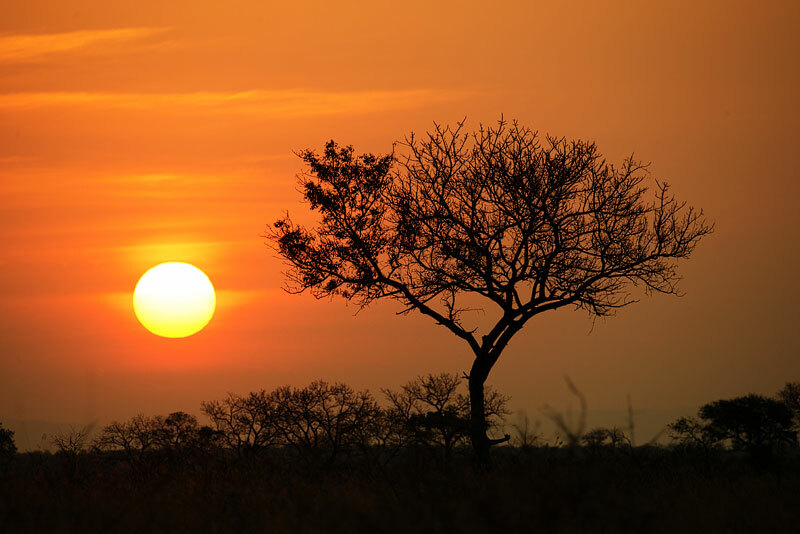 We ended up seeing a lot of wildlife at Umkumbe and we watched beautiful sunsets while enjoying sundowners on our afternoon game drives. We had been told that leopards love the Sabi Sands area and that we would most likely see one and on our last game drive when I had all but given up hope, we spotted one! Unfortunately while tracking the leopard our vehicle got stuck in a drainage ditch and it took us over an hour to get us out. It was a tad nerve wracking to have to get out of the vehicle at night, with hungry leopards around! After a vehicle from another camp towed us out, we started heading back to camp and spotted another leopard. Even though it was late we stayed out to follow the leopard as it marked his territory. One of our favorite sightings at Umkumbe was a male rhino who had adopted a young male rhino whose mother had been killed by poachers. This is the first known occurrence of a male rhino adopting a young rhino, normally a female would adopt it. There are two species of rhinoceros in South Africa, the white and black rhino. The White Rhino was on the brink of extinction but has made a tremendous comeback thanks to conservation efforts and there are approximately 20,000 left in the wild. The black rhino is critically endangered and there are less then 5,000 left in the wild. Their only predator is man….who poaches them for their horn, which is believed to have medicinal value, but actually doesn’t. The price for rhino horn in illegal markets has sky rocketed recently contributing to the rise in poaching over the past five years. South Africa has anti-poaching efforts in effect and they are working intensively to capture and convict poachers. The reserves are also starting a project that poisons the horns, which has no affect on the rhino, but sickens anyone who ingests it. Because the animals roam freely without fences, even from country to country, it is important for all countries with a rhino population to work together and have stiff penalties for poaching. Unfortunately in Mozambique (which borders South Africa) it is only a misdemeanor, compared to South Africa which recently sentenced three Mozambicans who had crossed the border illegally and were caught poaching, to 25 years in prison. If rhinos cross into Mozambique it is believed they have less than 48 hours to survive. Already this year, 553 rhinos have been poached in South Africa. There are some predicting that if poaching continues at this rate that the rhino will be extinct by 2025. Before we get too depressed about the rhino, let’s go back to our trip report. Umkumbe had a different “feel” than Africa on Foot . We stayed in a hotel room instead of a chalet, and it was a lot less rustic and had more amenities. Instead of one large table at meal time there were smaller group tables, so there was less getting to know the other guests. 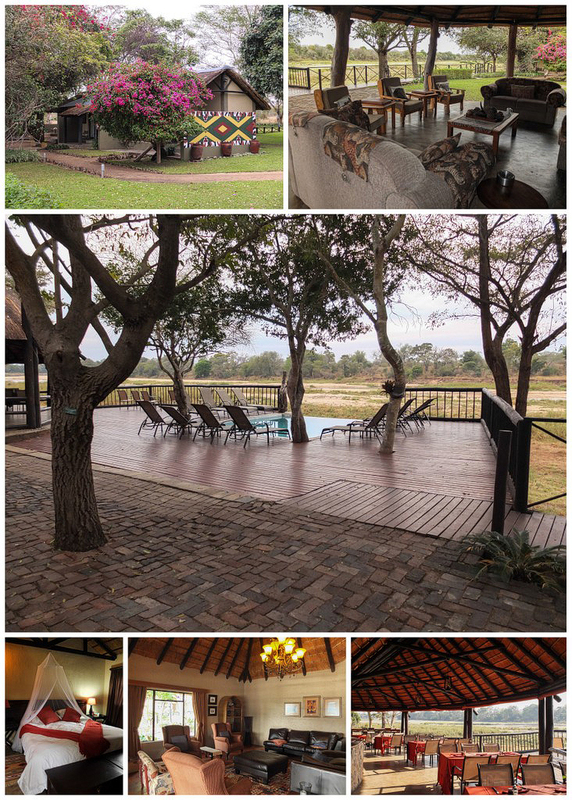 The location was absolutely incredible with a huge deck overlooking the Sand River, and I spent one afternoon watching baboons along the river. While it was a less personal and intimate experience than Africa on Foot we thoroughly enjoyed our stay here and guides at both camps were both incredibly knowledgeable and we felt like they truly wanted their guests to have a great experience. The really nice benefit of staying in smaller lodges and reserves is there are less vehicles at big game sightings. Sometimes it would just be our vehicle and there were never more than three. In Kruger National Park or bigger reserves, dozens of vehicles can be at a sighting and I have seen pictures posted of up to a hundred. That is definitely not appealing to us! We had an early afternoon flight to catch out of Nelspruit Airport and it’s about a two hour drive from Umkumbe so we decided not to go on the morning game drive. We had a long day of travel back to Johannesburg and then on to Cape Town and wouldn’t arrive until almost 9pm. Cape Town was not what we were expecting at all, it had a very European feel to it and our hotel, the Holiday Inn Express, was located right in the heart of the downtown and on a pedestrian mall. The weather was very different here, rainy and cool, and considering we were not that far from Johannesburg and Kruger, we were quite surprised. 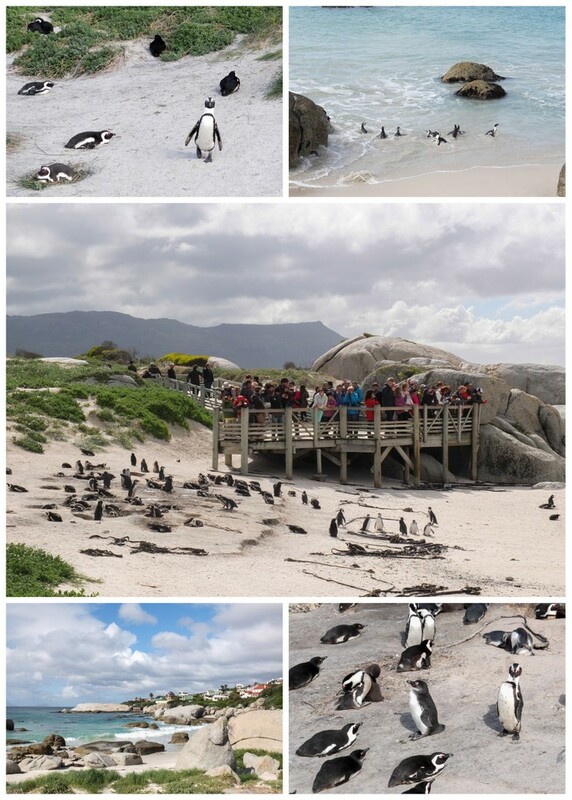 We had two days in Cape Town and the weather the next day was supposed to be the better of the two days so we decided to take the train to Boulders Beach to see the colony of African penguins that have taken up residence there. We took the train out to Simon’s Town and then walked the 1.5 miles to the beach, which has been turned into a park to protect the penguins. Visitors can walk around on a boardwalk to view all the penguins. They are so cute! Our final day in South Africa! We spent the day at the Victoria & Alfred Waterfront and went to a Nelson Mandela exhibit at the ferry to Robben Island where he was imprisoned for 17 years and The Cape Town Diamond Museum, which was interesting but was part of a Shimansky Diamond Store. I think they were hoping we would buy something. The weather turned out better than we expected and only showered occasionally. Cape Town is definitely worth a visit and we wish we had a few more days here to explore the area, especially the wineries, Table Mountain and the Cape Point area. Until next time! We are already planning a return trip to Africa and are looking at Botswana and Victoria Falls; we now have Africa in our blood! Absolutely Wonderful! Thanks for sharing your adventure.